Evo & Grace: The WanderLusts: Journeyman Finds Home: A journey to one’s self. Journeyman Finds Home: A journey to one’s self. We’ve seen a lot of films about how a sports became inspiring to one persons, we all know the hardships, the trials and struggles they face before they make it big to a field that they prepared so much. The Simone Rota docufilm is almost the same like the other, however it stand out because his story is such a journey in finding his roots, from Italy to Philippines maybe a common story to tell but his compassion in proving that he really value his sports and the people who take care of him from the start up to where he is now. Rota is professional football athlete, a former member of Philippine Azkals, the country’s flag ship team in football, and currently part of the Davao Aguilas team and now acting as trainer to the newbies of football, a sports that is not yet that popular in this tropic country. Journeyman finds home: The Simone Rota story retell his story from a orphanage in Cavite City to a lovely family in Milan, where he hone his skills as a player in a football team that lead for him to receive an offer to became a member of Azkals when it was starting way back then. And from that he look for that center and start his real journey, to find his real parents. But the docufilm give a happy ending to Rotas life, it is still a question remain at the end of the movie that he is still in search up to know. However the docu made a twist on his achievement as a defender of Davao Aguilas and of course, his track record in Azkals. “The main message I want to send is, that sports can inspire, to the kids to whatever chance in their life, in football it doesn’t matter if you’re rich or poor can play and it can change your life. And give more conscious to other people, mom and dad must think if you want your kids or not, because it will really change your life.” Rota said. Journeyman finds home: The Simone Rota story is under the direction of Albert Almendralejo and Maricel Cariaga, it was given a Graded A from Cinema Evaluation Board, it also receive Audience Prize at the 2018 Philippine International Film Festival held in Florence, Italy, and a special jury prize recently at the 2018 Sinag Maynila Film Festival. The film is travelling to theaters in Mindanao this 2018, hoping to inspire and give hope to parents and kids, that sports really can change once lives. 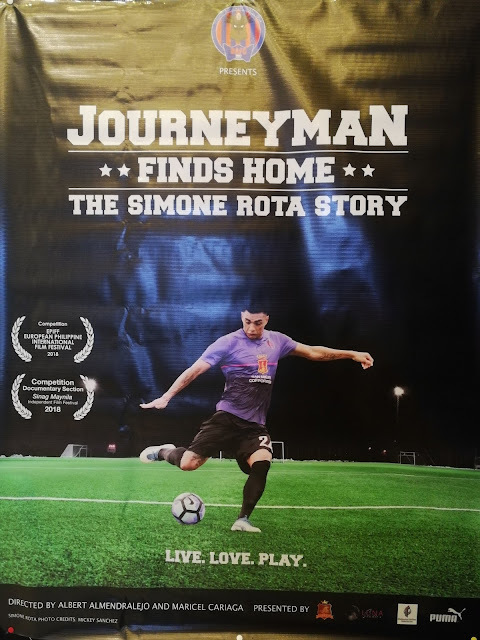 For updates about “Journeyman find home: The Simone Rota story" check out films facebook page. Palawan Museum. The museum at the park. The colors of sunset in Port Barton. Arsenic & Old Lace. Theater Review. Bb.Pilipinas Queens 2018 lits Manhattan Row.